These cookies are a delicious treat. If you want to make them ahead and freeze them omit the walnuts and freeze them as a bag of unshaped dough. 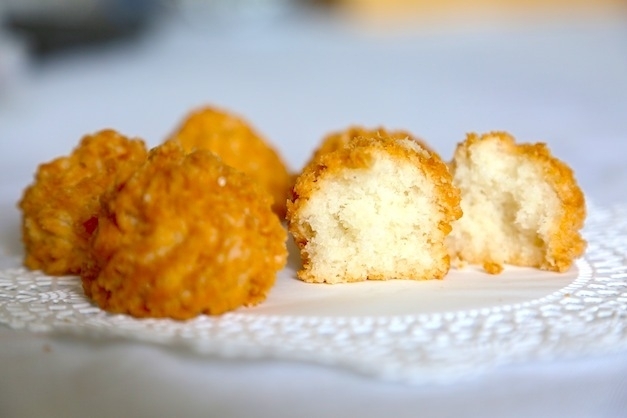 When you are ready to use them soften the dough, stir in walnuts and roll them into balls and bake. 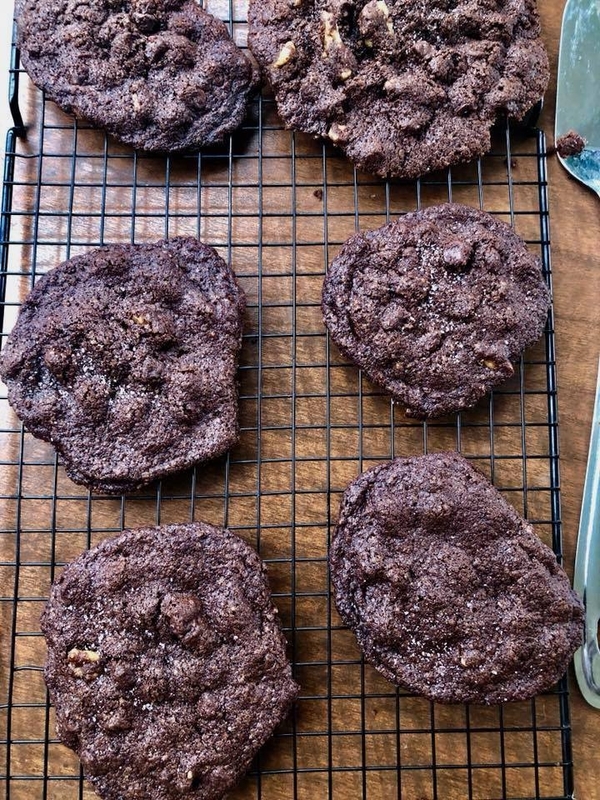 These made large, soft cookies. In a mixing bowl sift the dry ingredients and reserve. In a stand mixer fitted with a paddle attachment or an electric hand beater, whisk together butter, both sugars and vanilla until fluffy, about 5 minutes. Add egg and beat until well combined. On a slower speed add the dry ingredients in 3 batches and beat just until combined. Add the walnuts and chocolate chips and mix to combine manually. Form the dough into 12 equal size balls. Cover tightly and chill them for 3 hours in the fridge and up to 24. Heat oven to 350 degrees and prepare middle rack. Place 4 balls on the parchment equidistant as they will spread alot when baking. Flatten them just a little with the back of a tablespoon. Bake the cookies until set about 12-15 minutes but do not over bake, you want the centers to be soft and they will continue to cook and harden when removed from the oven. Cool cookies on a rack and only remove from parchment using a thin flat spatula when they have cooled. Sprinkle very lightly with salt. Repeat with the remaining dough. Serve warm and keep refrigerated in an airtight container in humid weather. Add the first 6 ingredients into a large sauce pan. Bring to a vigorous boil on high heat. Add the oats and stir quickly no more than 30-50 seconds. Switch off flame and immediately add the chocolate pieces. Stir in the toasted almonds until well incorporated. Drop cookies by tablespoonfuls onto wax or parchment paper. Smoothen them with the back of a clean tablespoon. Keep refrigerated. KRANSKEKAKE IS A NORWEGIAN COOKIE MADE FROM MARZIPAN RINGS. 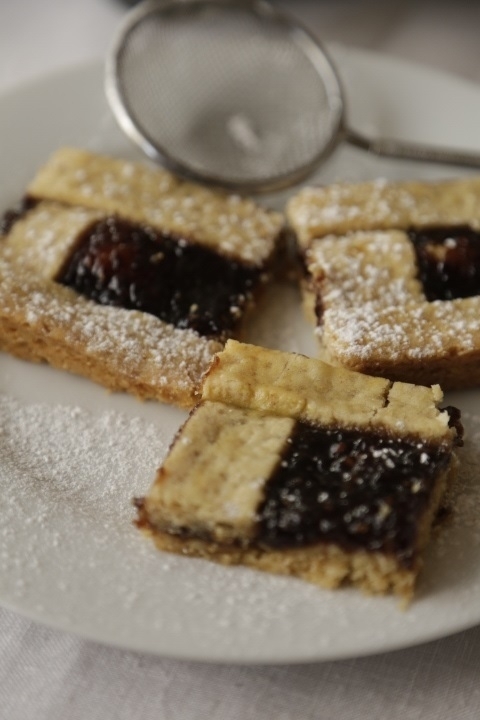 THE WORD KAKER IS USED TO DESCRIBE NOT JUST CAKES BUT A DISH THAT IS SWEET AND BAKED IN NORWEGIAN. IT IS ALSO CALLED KRANSEKAGE IN DANISH AND IS MADE FOR CHRISTMAS AND ON SPECIAL OCCASIONS LIKE WEDDINGS. A TRADITIONAL NORWEGIAN WEDDING KRANSEKAKE HAS18 LAYERS. THIS IS A VERSION MADE FROM COOKIE DOUGH. THIS IS A CLASSIC SUGAR DOUGH RECIPE. YOU CAN USE IT TO MAKE ALL KINDS OF COOKIES IN DIFFERENT SHAPES. Stir the flour, baking powder together. Reserve. Beat the butter and sugar until fluffy. Add milk and beaten eggs with vanilla and whisk until incorporated. Stir in a cup of flour at a time until a soft dough form. This dough will be sticky but will firm up once refrigerated. Turn into a clean and dry plastic bag or an airtight box and refrigerate 3 hours or overnight. Preheat oven to 375F. Cut parchment papers to fit 2-3 cookie trays. Sprinkle a clean surface area with flour. 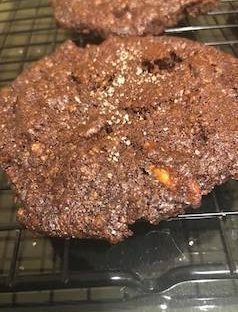 You will require several cups of extra flour as you roll the cookies particularly if you are working in a hot and humid climate. when the dough has softened slightly cut the dough into 3 equal pieces. Keep dough covered while working with each piece. Roll the dough to form a smooth ball. Use only as much flour as required. 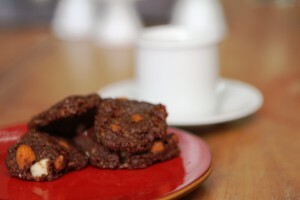 Excess addition of flour to the dough with make the cookies hard. Once the dough is easy to handle place it on the cut parchment paper and roll it to the size and thickness desired. Start rolling from the center outwards in smooth motions until the dough is 1/5 inch thick. Use the cutter desired, cut the shapes you like and pull away the cutter and the leftover dough. Start with the largest cookie cutter and work yourself up to the smallest. Cut a few extra cookies if you have dough. Sometimes they break while taking them off the cookie sheet so it’s úseful to have extras. Roll the leftover dough again and repeat until you have all the cookies you need. Lay the cookies on the parchment, Bake till golden. 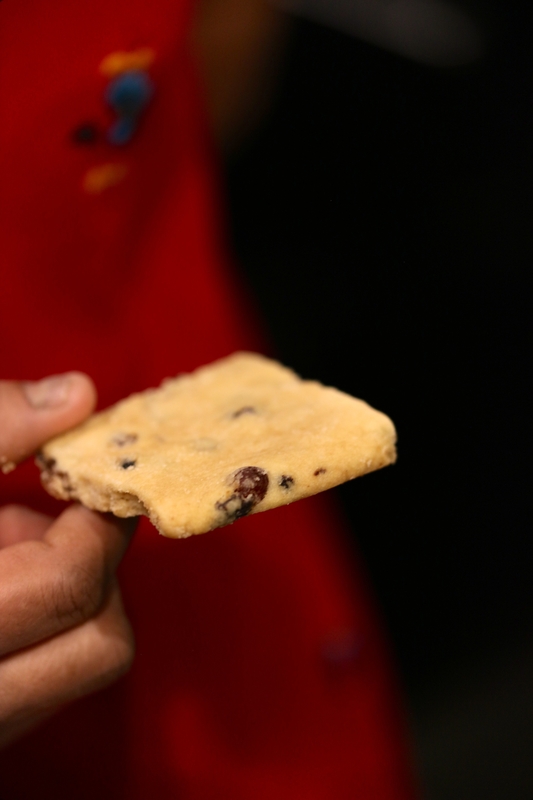 Bake long for a crisper cookie. Cool completely before icing. Refrigerate in air tight boxes in hot and humid weather. 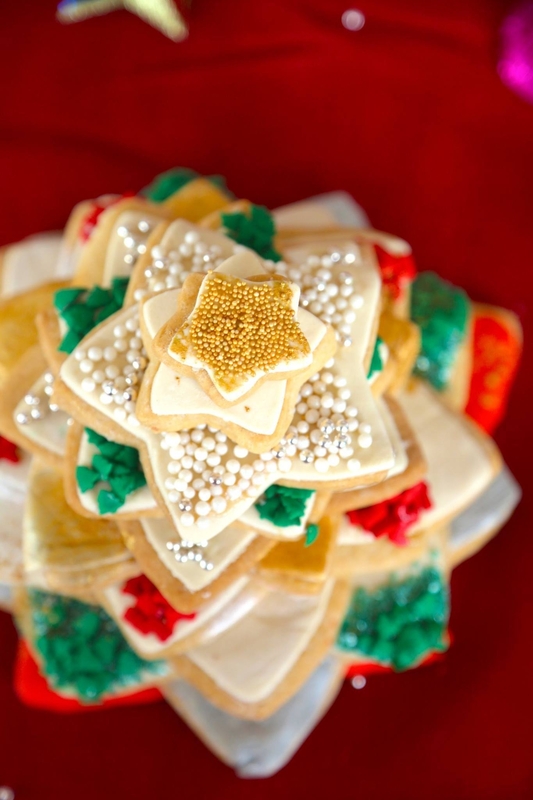 If using marzipan or fondant roll out the pieces and cut using the same size cookie cutter you plan to decorate. Apply edible glue to the cookie and lay the cut fondant or marzipan over it and press down very gently. Move on to the next layer and repeat with alternating colors or any color scheme you like. Place some edible glue on the base cookie over the fondant or royal icing especially in the center where the next cookie with sit. Place the smaller star over the larger one so that the corners of the stars donot overlap. Repeat with all remaining layers until you get to the smallest star. Apply edible glue to the tips and corners of all the stars and sprinkle on glitter, dragees or any kind of sugar sprinkles you like. Alternatively icing the tips with a design of your choice. Cool completely. These make wonderful Xmas gifts.